As a signatory to the United Nations Convention on the Elimination of All Forms of Discrimination against Women, the Beijing Platform of Action, and the Southern African Development Community’s Declaration on Gender and Development, Zimbabwe has taken significant steps toward gender equity. Guided by a National Gender Policy since 2003 and a Ministry of Women Affairs, Gender and Community Development since 2005, the country also guarantees, in its 2013 constitution, that every woman should have full and equal dignity of the person, including equal opportunities in political, economic, and social activities. The Zimbabwe Gender Commission is charged with monitoring issues related to gender equality. Despite these commitments, women and girls in Zimbabwe continue to face disadvantages in the political, social, and economic spheres. Public decision-making institutions are dominated by men: In 2015, women held 32%, 48%, 15%, and 24%, respectively, of posts in the House of Assembly, Senate, Cabinet, and ambassador corps (ZimStat, 2016). Of the 1,958 local councillors across the country, only 16.5% are women (ENSURE, 2014). With regard to top positions in the public service, in 2015 only 12 of 41 permanent secretaries (29%) and 12 of 51 principal directors (23.5%) were women (ZimStat, 2016). Women also trail men in access to agricultural productive resources: Only 19% of large-scale commercial farms are owned by women, while 45% of land owners in communal areas are women (ZimStat, 2013). Although Zimbabwe has achieved gender parity in primary school education, a gender gap remains in secondary and tertiary education enrollments (National Gender Policy, 2013). 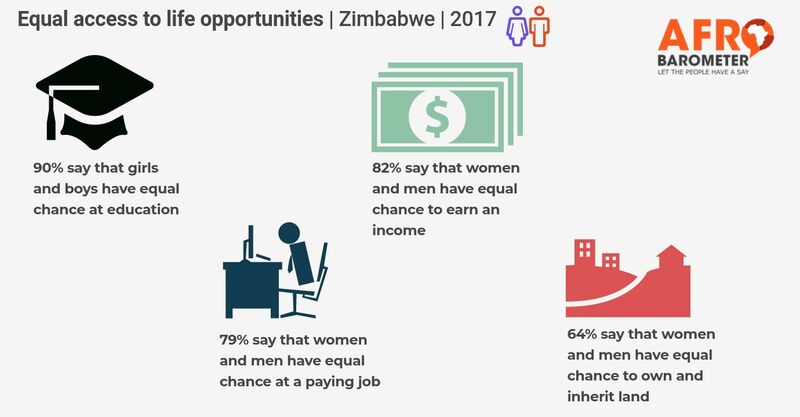 How do ordinary Zimbabweans see gender equality? Based on findings from the most recent Afrobarometer survey in Zimbabwe, a majority of Zimbabweans give a thumbs-up to the government for its efforts to promote equality between women and men. Most see opportunities for women getting better and think that equal opportunities already exist for women to get a paying job and to own and inherit land. But most Zimbabweans also prefer having a woman in charge of the home and the children.